Groups are a great way to organize your email marketing campaigns. If you have multiple campaigns with similar content, or you want to combine your campaigns by when they were sent, just group them together. 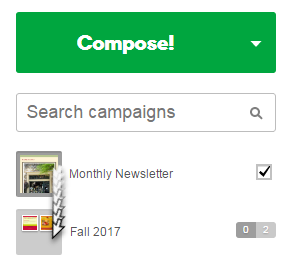 On the Campaigns page, under the Compose button, click the campaign thumbnail you want to add to a group. 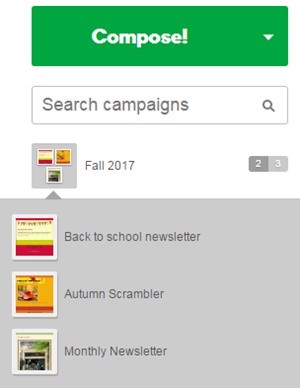 Drag the campaign thumbnail on top of the existing group. The campaign thumbnail now appears in the expanded group. The group thumbnail and the total numbers will update. 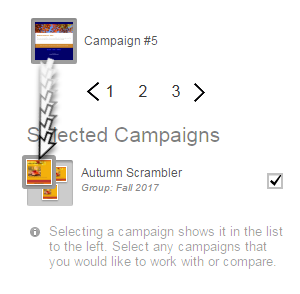 Select any campaign in the group, so that it appears under Selected Campaigns, at the bottom of your sidebar. 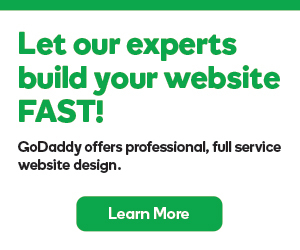 Find the campaign you want to add to the group, either by searching or navigating to another sidebar page. 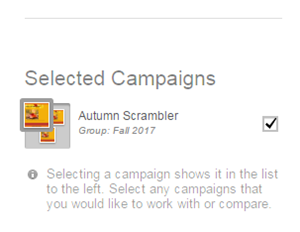 Drag the campaign thumbnail on top of the group campaign that's displayed at the bottom of the sidebar, under Selected Campaigns.